A NUMBER ONE LONDON GIVEAWAY! Have you already subscribed to our newsletter? If not, this is your lucky day. Simply sign up using the link in the right sidebar and you may be the lucky winner of a pack of What Happened Here? cards. 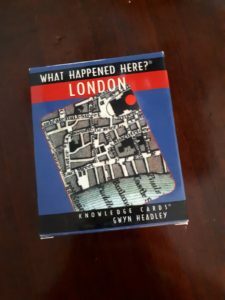 Each of the 48 cards offer touching, scandalous and/or noble snippets of historic trivia, along with corresponding map locations. Congratulations to last week’s winner, Diane Perkins! Good Luck – The winner will be announced next week! Sorry, due to mailing restrictions, winner must be resident of the US. Previous Previous post: IT’S BLACK FRIDAY AT NUMBER ONE LONDON TOURS! Next Next post: BRITBOX TV – IS IT WORTH IT?